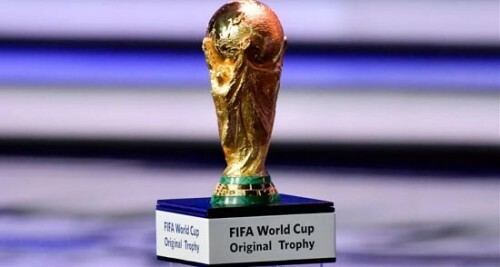 Moscow, May 1 (IANS) The FIFA World Cup Original Trophy on Tuesday landed in Russia, where it is set to embark on the longest host country tour to date. After a journey across 51 countries, the trophy arrived in the city of Vladivostok on a private jet carrying Brazil star Gilberto Silva, who won the 2002 World Cup, and Russian model Natalia Vodianova, reports Efe. "During a global journey that began on January 22, 2018, the FIFA World Cup Trophy visited 51 countries across six continents and gave over 330,000 football fans around the world a once-in-a-lifetime opportunity to see the Original Trophy up close," FIFA said in a statement. The trophy is to be presented in the central square of Vladivostok, after which it is expected to visit the remaining nine host cities of Novosibirsk, Yekaterinburg, Samara, Kazan, Nizhny Novgorod, Rostov-on-Don, Saint Petersburg and Moscow. On September 9 last year, Russian President Vladimir Putin and FIFA President Gianni Infantino kicked off the first phase of the tour, which saw the trophy visit 16 Russian cities before it moved on to its global tour in January. The present tour is due to conclude in Moscow's Luzhniki Stadium, a few days before the opening match of the 2018 World Cup between Russia and Saudi Arabia scheduled for June 14.